The send to menu in Windows can be used to quickly send selected files and folders to configured applications or locations. 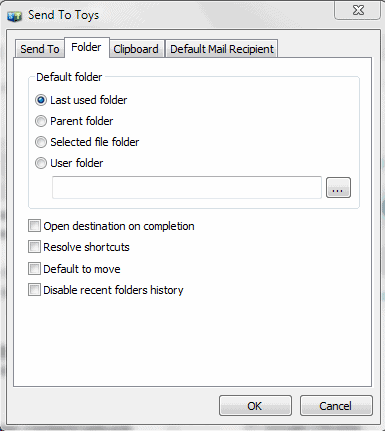 Default configuration is done in the SendTo folder in Windows which proves not to be that effective and straightforward as most users would want it to be. Send To Toys is a control panel applet for Windows that can be used to configure the send to context menu effectively and efficiently. The program window is opened upon launch and accessible in the Windows control panel. Windows 7 users find it in the Appearance and Personalization category. The application displays four tabs that divide the configuration options. 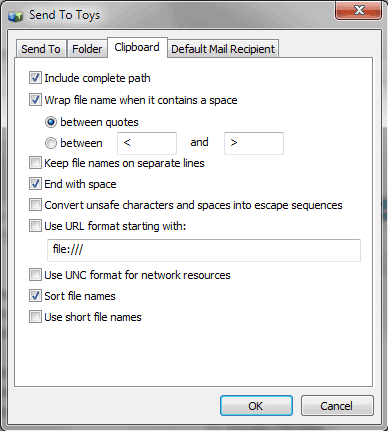 The send to tab lists several preconfigured Send to items that have been added automatically, among them Skype, run, clipboard, mail recipient, documents folder or recycle bin. It is possible to remove the links that are not needed by selecting them and clicking the Remove button. New items are added by clicking on the Add button and selecting a drive, folder or program to send the selected data to. 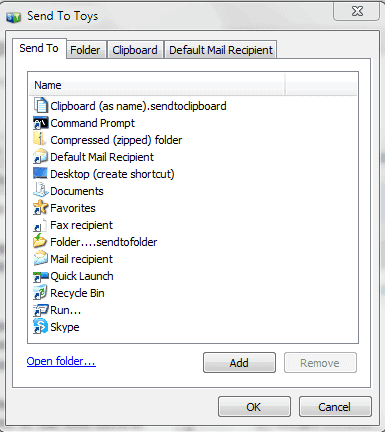 The open folder link opens the sendto folder in Windows saving the user the hassle to type in shell:sendto in the run box. The default folder can be configured in the Folder tab. Several options are available in this window including the last used folder and a custom folder specified by the user. Further options include to open the target folder on completion of the send to command, move instead of copy, disable recent folders history and to resolve shortcuts. The Clipboard tab contains several configuration options that are useful when items are send to the Windows clipboard. It is here possible to wrap files names in quotes or other chars when they contain spaces, include the complete path, keep file names on separate lines, sort file names and several more. The last tab can be used to configure the default mail recipient to send emails directly to that email address. Send To Toys is a useful little application for the Windows operating system. Windows users can download the program from the developer's website.